HOW TO GET A HOLD OF THE BEST ROOFING SERVICE AND GUTTER INSTALLATION CONTRACTOR IN AKRON, OHIO. Quality gutters, protecting your home Go Pitch Perfect provides and installs continuous rain guttering, also known as seamless guttering. 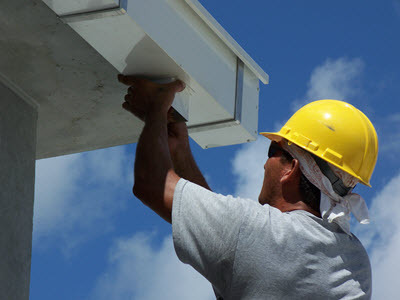 This product is nationally recognized as the most popular form of guttering because it eliminates unsightly seams, reduces the possibility of leaks, never needs painting, is formed on the job site for exact measurements, can be installed quickly and has many color options to choose from. The purpose of your guttering system is to collect rain water from the roofing area and disperse the water away from your home. Properly configured downspouts (leaders, drain pipes) are essential. A faulty guttering system can contribute to damage of your shingles, foundation, driveway, walkways and landscaping. Go Pitch Perfect uses a hidden hanger when installing gutters to ensure that screws don’t back out. Standard gutter spikes back out due to contraction and expansion of the gutter until they pull loose from the fascia. Loose gutters can increase the chance of wood rot at the fascia board and along the eaves of your home. Guttering systems require frequent maintenance to insure optimal protection for your home. Make sure your gutters are free from debris, leaves, granules from shingles and birds’ nests. The extreme exposure to nature can also cause sealant failures and snow and ice can loosen fasteners. These problems should be fixed immediately to prevent more major (and costly) repairs to your roof or foundation. Residential Gutter Contractor Go Pitch Perfect offers Leaf Relief to solve gutter maintenance issues. Call or fill out the FREE instant quote form for your gutter needs in Akron, Ohio.